A double chin can make you look older and heavier no matter what your age or weight. In many cases, this fat doesn’t respond to lifestyle changes such as diet and exercise because genetics is often the cause. If you’re one of the many who are frustrated with excess fat under your chin, there’s good news! We can now help redefine your neck contour non-surgically with Kybella™. Since April 2015, Kybella® fat dissolver has been revolutionizing the world of non-surgical cosmetic treatments. You may have seen Kybella® on Good Morning America, news programs, or while surfing the Internet. Many in the cosmetic industry are hailing it as the biggest innovation since Botox. The injection contains deoxycholic acid, which is a naturally occurring molecule in the body that helps break down adipocytes (fat cells). 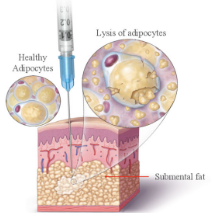 When injected properly, all other cells are left healthy and intact while the fat cells are permanently destroyed. KYBELLA® is a prescription medicine and is the only FDA-approved injectable treatment used in adults to improve the appearance and profile of moderate to severe fat below the chin (submental fat), also called “double chin”.